Your sales team could be closing 20% more deals. Want to know how? It's time to be direct: sales training stinks for many IT staffing companies. And, it hurts their profitability and growth. Why does it stink? 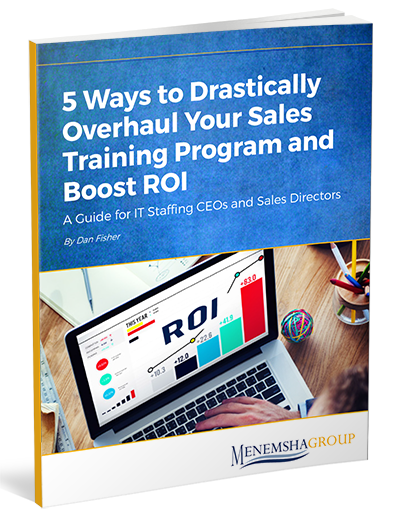 It's simple: most IT staffing companies provide very little training for their reps. If/when they do provide training, it usually involves simple (and ineffective) shadow training, or dumping a metric ton of information on the new rep from day one. To make matters worse, companies ask their top salespeople to train new hires...meaning they have no time, or direct incentive, to provide the training that the new hires need. It's hurting your bottom line. Want to better train your reps and boost your bottom line? The Corporate Executive Board has discovered that strong onboarding and consistent training can boost performance by 19%.